I wish I knew the whole story about why we have an antique folding organ in our family room, but I don’t. What I know is this, someone in the family, most likely my father’s youngest sister, Corrine, used to play this organ on Sundays in church. She had it at her house for years, then gave it to my dad. It took up room in their house so my mom asked me if I wanted it. Of course I did. 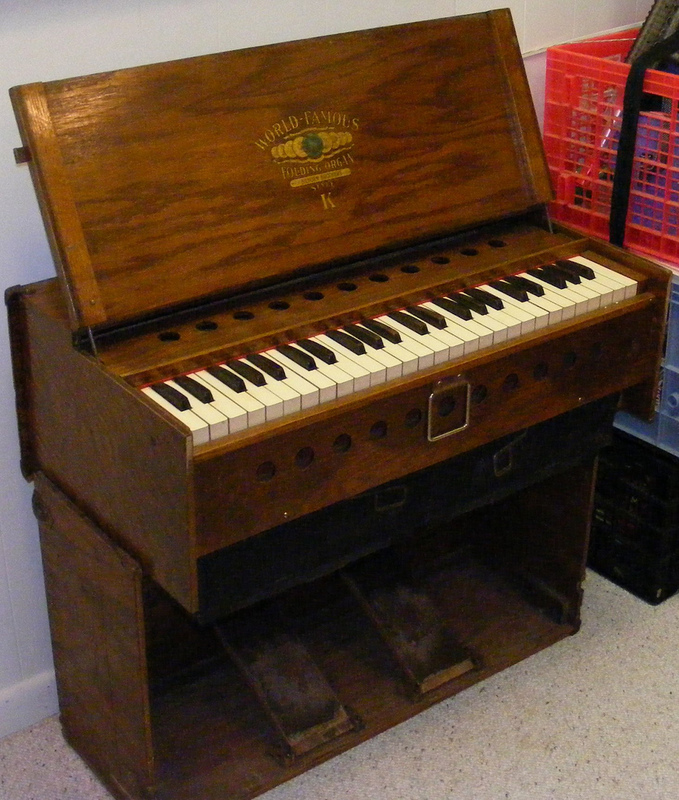 I don’t know anyone else with a World Famous Folding Organ in their family room, do you? As you can see from the photos, the organ looks more like the keyboard of a piano in a plywood box than an organ. That’s the point, I guess. This organ can fold up into approximately a 3′ x 2′ x 1′ box with a handle. To play the organ you need to move your feet up and down on pedals. If you’re like me and cannot walk and chew gum at the same time, this presents a problem. I think you also need to do something with the two metal doodads that fold out and go on either side of your knees. Maybe they are like the “stops” on regular reed organs — maybe the pitch goes up and down. Can you tell I know nothing about organs or music, for that matter? I accepted the organ on the pretext that Clare wanted to learn how to play it. My dad used to ask me if Clare was learning how to play the organ every time we spoke. I don’t think he really cared that we took the organ, but he seemed really curious about it. She never did learn, but once a couple of her friends who could play pianos used it and it sounded really good! I however, did not sound so good when I tried it out. Here I am playing the only song I know how to play, Mary Had a Little Lamb, just to show you how the organ works. You can listen to other people play folding organs on YouTube if you so desire. 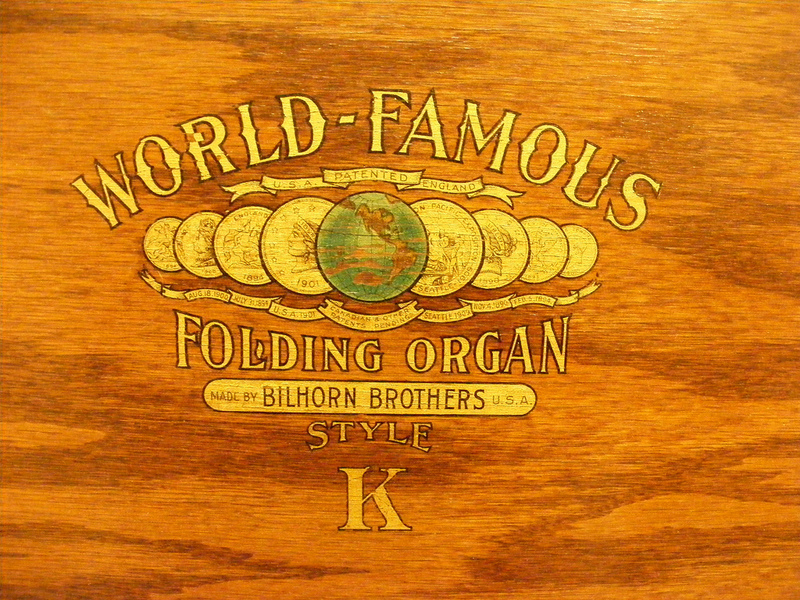 There’s a little information online about the Bilhorn Brothers and their World Famous Folding Organs. I liked this advertisement for it. The poem is a little creepy, on a couple of levels. The sinners lost to call. Because it folds so nice. You need not fold it twice. Since carried by one hand. Than any you can find. You’ll take it every time. It’s just the thing for you. There’s nothing to be lost. We’ll ship it C. O. D.
The organ you will find O. K.
And be well pleased, you see. I talked to my mom yesterday and she corrected some of my misunderstandings about the organ.1. My folks didn't get it from my Aunt Corrine. They got it from a friend of my Dad's mother. I don't know how the friend ended up with it, but the minister of their church had more than one church, so he lugged the organ along with him.2. My mom gave it to my Aunt Corrine, but she gave it back to my mom. (Whew, I was worried she'd want it back) She probably never played it at church.3. 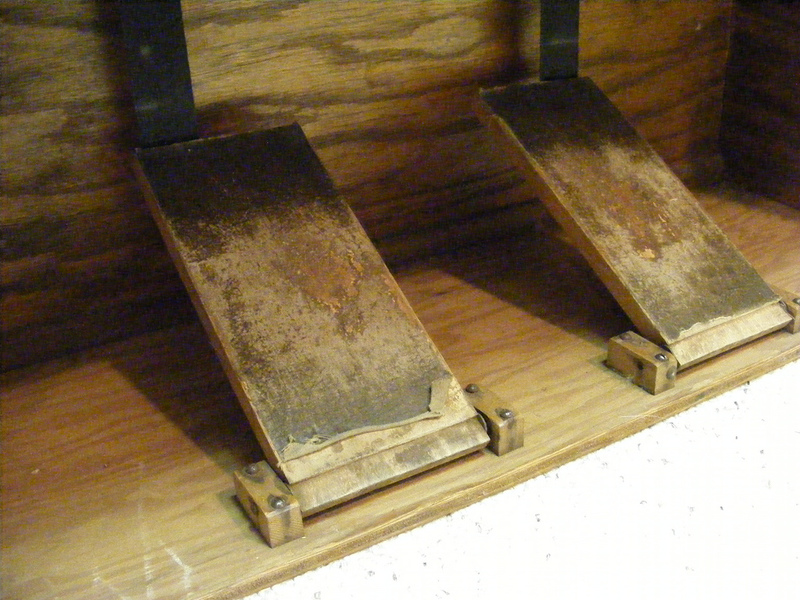 The doodads on either side of your knees as you sit down make it sound like an organ — you know with the ghostly sound — like a harmony. It is like a piece of exercise equipment, Tina. I think my chair is a little too high. I think my feet are supposed to do the work. Wow, I'd never heard of a folding organ! I loved the performance. I think I'd find it very distracting pumping the feet and trying to play! Wow, that's amazing. You'll have to bring the organ when you visit Mali in New Zealand. And awesome performance! It may be a portable organ, but it is far too heavy for me to carry. You'll all just have to come down to Bethesda someday to see it in person. I just read your comments about the folding organ you acquired. I have one identical to it except it is the “L” model. There isn’t much about these organs except the brothers who built and sold them in the early 1900’s. My father acquired the one I have and I don’t know where he got it. I wish I had asked him before he died. It plays very well and sounds a lot like yours. They are quite a conversation piece! Antique wise, according to what I have been able to find out they are only worth from $150 to $300 in good shape. Appreciated the info and photos. Thanks for commenting, Crystal. They’re fun to have, aren’t they? I checked how much it was worth too — not that I would want to sell, but just making sure I wasn’t cheating my mom out of a large amount of money in case she wanted to sell it. My husband is not fond of the organ, but at least now he doesn’t have it folded up and hidden behind the end table. We too have a World Famous Folding Organ but ours is in our dining room. I have frequently wished I could find a nice home for it because no one in the house plays a keyboard instrument. But every time I dust it I think that it is such a pretty thing that I decide not to try to sell it. If nothing else, it makes a good music stand. And who knows – maybe I will learn to play it yet. I have also seen one listed for$900.00 and the upper keys were not working on it. the one I have is covered in black leather like material,but is other wise like the one pictured here. greetings! great blog! i am a musician living in northern california and have been working on a new batch of songs on the pump organ. i am desperately seeking a folding bilhorn on which to perform them on. any chance you could find it in your heart to sell yours? thank you for your time! Nope, sorry cj. It is not for sale. Albert, I’d be very interested. I’m a working musician in New Orleans. A few of the projects i work with are old-time, or otherwise acoustic, and one of these would be wonderful for both live performance as well as studio use. I’m not prepared to pay a super high price (musicians wages – ergh!) but am definitely interested and would do any necessary repairs and keep ‘er up and running with good care! Hi Albert. Very interested. I’m at operative011@gmail.com. Thanks! I have a Bilhorn Telescope organ. Style 1 – #41043. It is all original. The G Key and High E key are not working but could be fixed. Other than that it is in pretty good shape with only a small part of the plywood missing from the bottom. 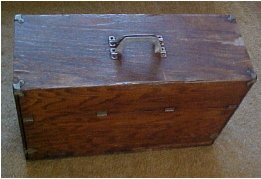 It was used by my husband’s parents in early 1900’s. They were associated with The Salvation Army and it was played on street corners. The keys are in perfect condition (except for two which do not work) and the feet bellows are good. I am ready to sell to an interested party who recognizes the uniqueness of this instrument. I’d be much obliged if you’d contact me at operative011@gmail.com. I’m familiar with that model and would be very interested. Hi Casey. Waiting to hear from you.